YOGYAKARTA, Indonesia (Ugm.ac.id) ~ Yogya Literature Foundation (Yasayo) confered Yogya Literature Prize to two literary scholars and a writer. They are Prof. Dr. C. Bakdi Soemanto as an expert in literature, Dra. Sri Widati, a researcher of Indonesian and Javanese literature and Evi Widati, a creative writer. The announcement of award winners and award hand over took place in the auditorium of Faculty of Cultural Sciences UGM, Wednesday (20/4). Founder of Yogya Literature Foundation (Yasayo), Prof. Dr. Rachmat Djoko Pradopo, said the bestowal of Yogya Literature Prize will be held two times a year. 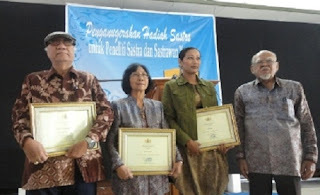 This award is given in turns to literary figures , experts, researchers and Indonesian and Javanese literary essayist who are eligible, and have residence in Yogyakarta. "The prize is awarded to encourage and develop literature in Yogyakarta, and it will be held twice a year every April and November," Djoko Pradopo said. As a foundation established on March 1, 2011, Yasayo hoped to encourage a variety of literary activities, especially Indonesian and Javanese literature in Yogyakarta. In addition to literary discussion, Yasayo plans to hold a discussion and support publication of various works of literature, either Indonesian and Javanese, creative or scientific literature as well as literary essays. Dean of the Faculty, Dr. Ida Rochani Adi, welcomed the event. The award giving for writers, according to Ida is a rare event. Meanwhile, talking about culture and literature as a science in many universities sometimes makes many people not seeing their direct contribution to the nation and state. "Therefore, I appreciate this kind of event," she said. Dr. Aprinus Salam, M. Hum who contributes to establish the Foundation, explained the award of literary prizes is not based on valuation but decency. Prof. Dr. C. Bakdi Soemanto has been selected because of his expertise, and he has published numerous books of literary science. As a creative writer, he has also published several books, including poetry anthology, anthology of short stories and a collection of folklore of Yogyakarta. "The tribute to former Chairman of the Arts Council of Yogyakarta, is not in the field of research and writing of creative literature, but expertise of literature science," Aprinus said. Meanwhile, Dra. Sri Widati, in Aprinus’s opinion is a senior researcher in Javanese and Indonesian literature. In fact, she once received Rancage Prize from Rancage Foundation led by Dr. (Hon) Ajip Rosjidi, and many times leads Sanggar of Javanese Literature of Yogyakarta. "Moreover, in August 2011 she will be retired, therefore the seniority of Sri Widati’s literary expertise is important to be awarded," he added. Meanwhile, Evi Idawati is a cultural and literary activist. She writes literature and some have been published, including anthology of poetry, novels and collection of short stories. Even she writes plays and became an actress. "Evi is a reliable drama player, she is active in the field of arts, moreover in creative literary art," Aprinus said. In addition to the charter, each recipient gets money prize as much as three million rupiah. The awarding ceremony was enlivened with poems and poetry readings of Chairil Anwar and Rachmat Djoko Pradopo by students of Faculty of Cultural Sciences. The reading of short stories and works of Bakdi Soemanto and rhymes reading by Evi Idawati were also conducted.